About two weeks ago, on 3.6. to be precise, I took part in my first ever (and obviously hopefully the last) university entrance examination. Now I want to write about the experience. Perhaps this post will help somebody who is about the have an entrance examination by giving an example of how things go or perhaps somebody will find this as an interesting look into the (Finnish) university world. I applied to study business in various Finnish universities, so obviously this post is related to that. I know many other subjects have different types of entrance examinations and different schools have different procedures, but perhaps this post gives some kind of imagine what the exams could be like. I will also tell about my feeling throughout the day. I would assume that somebody applying to study business, would have enough English skills to read this post, but if it would help anybody I can of course translate my thoughts into Finnish too. And I of course answer all questions, both Finnish and English. As a background info, here is how the application and entrance examination systems work: In Finland there is a joint application system (other Nordic countries too, give or take on Iceland). This means that you send one application during each application time. In spring you apply to start the next autumn and in autumn the next spring. Most university programs (the progress is the same with secondary schools too) start in autumn, so spring is the main application time. In the application form you can apply to seven different programs, in both universities and polytechnics. You put your desired programs in a preference order; This means that if you get offered a place in the school you put first, you can not be offered a spot in the others. So, you get offered a place in the school that is the highest placed on your list of those schools that you are eligible to get into. Some programs require an entrance examination, some do not. With business programs, there is a joint examination: All the business schools work together, so that you only have to take one exam and not a separate one for each school you applied to. (Though some specialty business degrees have their separate exams. These are usually the programs taught in English, so they have an English entrance examination.) You take the exam at the school you put as your first choice. I put Turku as my first choice, even though the degree taught in Kuopio is my number one preference. This was because: 1. The city of Kuopio is so complicated to get into, that it would have been very expensive to get there (I would have had to stay at a hotel and take two or three trains to each direction) and 2. Turku has so high points required to enter, that I would not get those. 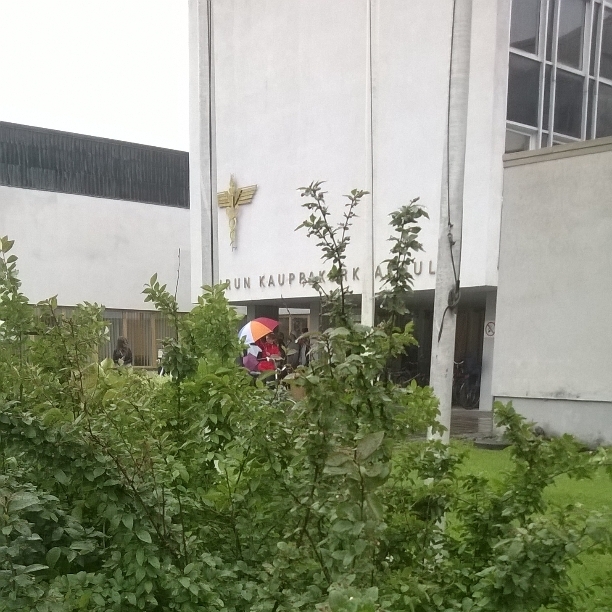 Turku is also easy to get to (easy as only 12 hour train ride to each direction), so I decided to do my exam there. I could have put some closer location as my first opinion too, but those had lower point requirements, so I would be in risk of getting there instead of Kuopio that I put as second. So after a sleepless night (I can not sleep in a train), I headed to Turku University. 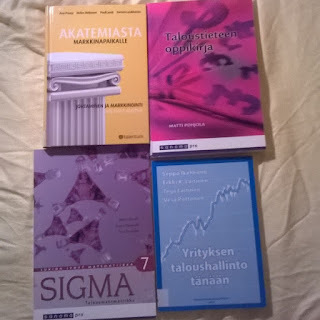 Honestly, I am not that interested on studying in Finland (in this post I talked more about this), so I was not very motivated to read the books. And since I was half asleep (I literally almost fell asleep couple of times and I never have fallen asleep while sitting up nor in a crowded room), I most likely messed up the entire exam. Oh well. Around the time the exam was to start there was a name call. I was a bit nervous, since I am fairly shy person and my throat was so sore that I could not really get a word out (I forgot to take a throat pastille until it was too late to do that). Luckily I survived with at least some dignity (okay, holding my wet shoes in my hands was not very dignified and made it hard for me to pick up the paper I was handed to). If you are nervous about the name call, my tip is to stand close to the person you are suppose to answer to. That way you do not have to yell "present" from all the way across the hallway. I purposely made my way closer when it was time for the name call. Couple interesting points about the name call. I noticed a lot of the people called, were not even there; I was the seventh to enter the examination room and like over 20th to be called. This surprised me a lot actually. Other thing was that it took a long time, around twenty minutes. It was very boring to sit there and wait for it to end. I remember listening to the names and it felt like it was going to drag on forever (I remembered the last name to be called from the sitting order)! Who knew there were so freaking many people with the last name Häkkinen... It took about 20 minutes to get through the name call. After everyone was seated, it was time for the instructions. Everybody needed to check their papers, calculators (you can only bring pencils and rubber with you, everything else is given to you) and sign the answer sheet simultaneously. The examination began at 10.22. The questions are on a pile of paper and you need to mark your answers on a optical answer sheet ( = you black the correct circle). They give you proper instructions on how to do everything, so I would not be worried about that. In Finland, the business school exams include only multiple choice questions. Most of the questions had four options, though there were also true and false questions. This may make the exam sound easy, but some of the questions were very complex and the answer options can fool you around. Also the calculator you get is very basic, so you need to be able to do the math parts without proper calculator. In the train I actually heard somebody talking about the exam they had taken and I was very lucky I did not have to do that. They were applying to social work program, I think. They had been giving a 40-page pile of papers in the exam (I am fairly sure it was forty, though it could have been even more) and told to read it and answer the essay questions (four questions, some with multiple sections, if I recall correctly) based on the text. I am very slow reader, so I would have not even finished the papers in the four hour exam time, let alone had time to write my answers. I suppose this works very well for some, but for me this sounds like a nightmare. In the business examinations, they give a list of the books the questions will be based on like a half year prior. You need to study three books and the things taught in a high school economic mathematics course, so overall four books (unless you did the mandatory math course in high school). This requires a lot work, so for some the exam type mentioned in the previous paragraph would sound more preferred. You get one point for correct answer in the multiple choice questions and half a point in the true/false questions. For a wrong answer you lose half of what points you would receive for a correct answer. You can leave as many questions as you like unanswered. Unanswered questions do not take away any points. There are different amount of points granted for different books, so I myself focused more on those that gave more points. The examination lasted for four hours. You can take a supervised bathroom break, though they advise you not to. You can not bring food or drinks to the examination room, so I at least became very hungry towards the end of the exam (even though I ate a protein bar just before the name call) and it too affected my performance. I sat on the first row right in the middle (they seated you in the name call order and I was amongst the first ones), which I found a bit bothering since the supervisors sat right opposite to me. Also, when people handed over their papers to the supervisors and talked to them, they did it right in front of me. This bothered my focus occasionally and I definitely had one of the worst seats of the room, if not the worst. You can leave a hour after the exam starts. I sat there the entire time and find it hard to believe anyone could finish in just one hour. Since I could hear what they talked with the supervisor while handing in their papers, I believe that the most of whom left early were there because they had to and had no interest on getting into the school. Some also asked for a paper proofing that they were there to give to army, so I assume some also had participated to skip a day of army. It seems pretty much all of those that requested the proof of presence paper, left very early on, which just backs up my theory. Well, like I said I probably messed up since I was so unfocused for multiple reasons and not well-enough prepared. But it is all good, just as long as I get into some Danish school I applied to. The results come about a month after the examination (they handed everyone a paper with dates and instructions about the results). I am interested to see how it went, but I bet not that well. At least I am one experience richer now. Somewhere in this sucking photo taken through moving train's window, you can spot a rainbow I saw while heading home. A good sign? I think that was about that. At least I now can not think of anything else to say on this matter. If you have any questions, I will try to answer them as good as I can!